JUST IN: As expected and as part of the Losing Party's evil plan and desperate attempt to overthrow our duly elected President and in order to protect their own selfish interest, nag lodge ng complaint ang lawyer nila sa ICC using two self confessed criminals as sources of info., Lascanas and Matobato. 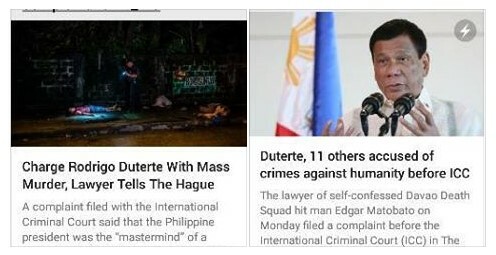 Ang gagago talaga at halang ang mga kaluluwa! Be informed. Be vigilant. But again, please do not share the links of these news sites directly. Stand by for Malacañang's official statement.